Did you mean: superman the man of steel 26 1993 (33 items)? New ListingSuperman: The Man of Steel #26. Oct 1993. DC. VF/NM. 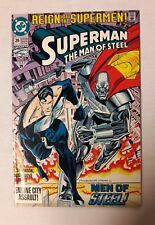 SUPERMAN : MAN OF STEEL #26 REIGN OF THE SUPERMEN * MONGUL DC 1993 NICE!!! Superman the Man of Steel # 26 (DC, 1993) Reign of the Supermen! SUPERMAN THE MAN OF STEEL #26 OCT 1993 SIGNED WRITER LOUISE SIMONSON COA ~ D.C.
Superman: The Man of Steel #26 (Oct 1993, DC) Reign of the Supermen! 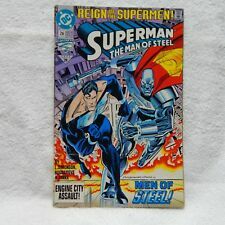 1 product rating - Superman: The Man of Steel #26 (Oct 1993, DC) Reign of the Supermen! 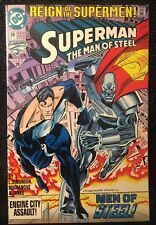 Superman: Man of Steel #26 - Oct/93 - Reign of the Supermen! This page was last updated: 25-Apr 09:38. Number of bids and bid amounts may be slightly out of date. See each listing for international shipping options and costs.